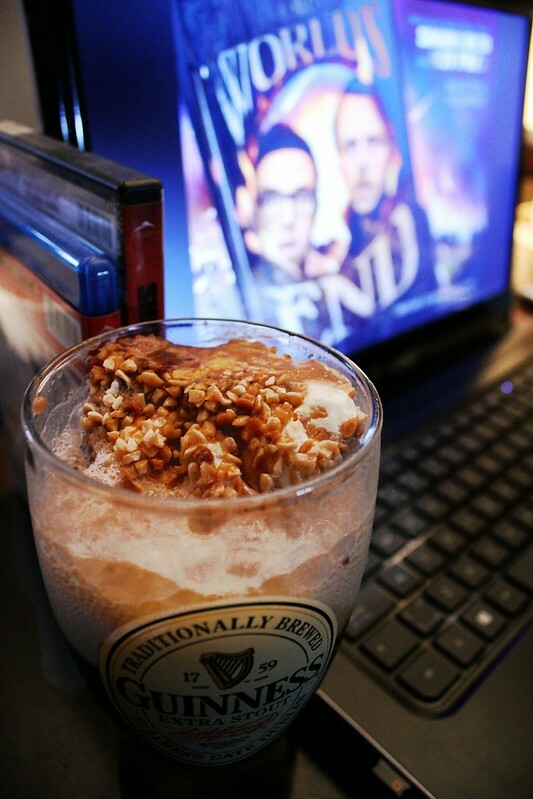 The World’s End and the Failed Cornetto Beer Float Experiment – I WILL EAT YOU! Dropped a Drumstick (Canadians do not have Cornetto ice cream snacks. We have Drumsticks. As far as I can tell, they are exactly the same thing) in a glass. Noticed the cone made the Drumstick taller than the pint glass, so I removed (ie. ate) the bottom half of the cone. Then I slowly poured a bottle of Dead Frog (Classic Nut Brown Ale) around the ice cream. It foamed up pretty much immediately, so it became a very slooow pour. Anyways, the result was what you see above. Tasted better than expected, but there something very visually off putting about seeing a mound of chocolate and nuts sticking out the top of your beer. Tasted okay, but not enough really to justify the waste of the Drumstick and the Dead Frog (although I will say that finishing the beer off, the slightly chocolate smell in the glass was loverly.). When all is said and done, eat your ice cream and beer separately. It’s for the best. And also, go see The World’s End this weekend. I would like them to make more please.